Nowadays, VOIP softphones are used by millions of users worldwide to make voice and video calls. Pre-configured softphones like Skype are very popular among users around the globe. However, there are several good and powerful VOIP softphone applications that can be easily configured to work with the service provider of your choice, provided you have the required subscription. These softphone applications are not only free but also have all the advanced features for call recording, call transfer, call conferencing and contact management. You can try out each one of these handy solutions to know which one fulfills your needs to the fullest. These VOIP softphones work seamlessly on a decent broadband connection and give clear voice during the calls. All you need to know is the way they are correctly configured through their help documentation. I've handpicked some of the best solutions for your consideration so that you can try out each one of them to select the best VOIP softphone application. 1. X_Lite: It is one of the most popular free VOIP softphone. X-Lite 3.0 comes with stunning interface and use Session Initiation Protocol(SIP) for all media communications. X-Lite also uses Quality of Service(QoS) feature to auto enhance to voice or video call quality. It also maintains complete call history with a feature-packed address book. X-Lite is also able to record voice and video calls on demand. 2. Ninja Lite: This softphone also supports both voice and video calls. Ninja Lite supports all advanced features like call recording, recent calls (Dialed, received and missed), address book, NAT/firewall support, skins, call timer, caller id, mute and much more. It also has built-in conferencing feature for multi-user sessions. 3. Firefly: Extremely light and best interface I have ever experienced. Firefly integrates fully featured voice mail system. It also includes drag 'n' drop contact management system, which makes it very user-friendly. After installation, you can create an online account for easy call record history in real time. You can initiate multiple calls from Firefly at a given time, and can later turn it into a conference. 4. Express Talk: Another excellent VOIP softphone, which offers free voice and video calls between PC's. You can configure up to 6 calls on a single line which includes conferencing facility. Express Talk can easily work behind NATs and Firewalls. Express Talk can be easily integrated with Microsoft address book for easy import and export of contacts. It also supports call transfer feature. 5. 3CXPhone: Small businesses can take advantage of this powerful and flexible VoIP softphone to connect all their communications under a single platform. It can run both ion desktops and smartphones without any issues. It supports large numbers of VoIP providers and costs nothing. All you pay is for the VoIP service you're using through a provider. It has a nice flat interface which is soothing to eyes. 6. Zoiper: If you're looking to open your very own call center, try this reliable VoIP softphone system which can run on all popular platforms. All the audio and video calls completed through this softphone are fully encrypted and secure from intruders. It also comes with CRM integration to gel it tightly with your existing business flow. It's light on system resources even at peak load. 7. Linphone: This open source VoIP softphone can be used in different. Apart from running it directly within your web browser, you can also use it on a desktop or on your smartphone. You can easily build a local SIP calling network for your company through this softphone solution. I liked its web interface which is blazing fast and works with all modern web browsers without any issues. 8. VoIPstudio: This powerful VoIP solution is best suited for businesses who want to migrate from PSTN to SIP calling technology. It provides several premium features with unlimited free calls for your internal network. It can integrate with several third-party business applications. It can run on mobiles, tablets as well as on desktop devices. It also provides SMS and Fax gateway for quick business communication. 9. 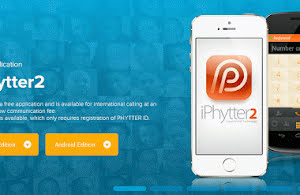 Phytter: This free VoIP softphone is available both for Android and iOS platform. It enables you to make international SIP calls right from your smartphone. Its interface is very user-friendly and one can get started with their first call in no time. The rates are lowest in the segment giving you cheap SIP calls that fit your budget. It also offers fax and conferencing applications. 10. Mobydick: It's available for desktops as well as for mobile devices. Integration support for ERP and CRM applications ensures it can work with your existing business workflow seamlessly. It also supports secure file sharing while you're talking through a SIP call. Video calls are crystal clear and work without any hiccups. I'd highly recommend using this SIP softphone.